Mysuru: BJP State President and the Leader of Opposition in the Legislative Assembly B.S. Yeddyurappa has dared Chief Minister H.D. Kumaraswamy to dissolve the Assembly and face fresh polls. “If you have the guts, dissolve the Assembly and come for election,” Yeddyurappa thundered. He was speaking during the thanks-giving meeting of BJP under Krishnaraja Assembly Constituency yesterday at Rajendra Kalamandira on Ramanuja Road where he thanked the voters for choosing the BJP and party workers for ensuring the victory of MLA S.A. Ramdas. “Kumaraswamy, who is under the mercy of the Congress for making him the CM, should come out of the coalition and seek people’s mandate once again, if he has self-respect,” he said. “People are already fed up of the government and they have seen the drama enacted by ‘father and sons’ party JD(S) which is supported by Congress. Shamelessly they have come together and have gone against the people’s mandate,” the former CM lashed out. The Government has a short life and Congress will not allow Kumaraswamy to govern. “Already Congress leaders have openly stated that if they support JD(S) for five years, Congress will lose relevance in Karnataka. We are witnessing tussle for power almost every day. Even Kumaraswamy is not sure of running the Government for a full term,” Yeddyurappa said. “If the elections are held at this moment, the BJP will surely win 150 seats as in many constituencies, we have lost by narrow margins,” he said. Yeddyurappa said that there was too much confusion prevailing between leaders of JD(S) and Congress and the coalition Government will not last long. He said people would not accept opportunistic politics practiced by Congress and JD(S). BJP State President B.S. 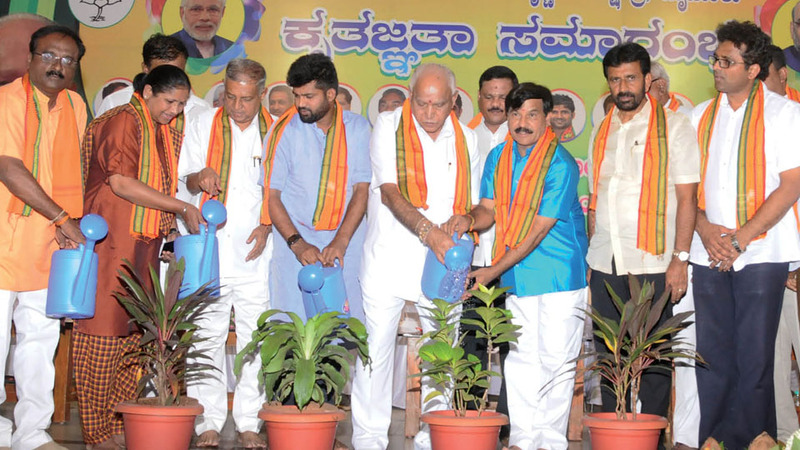 Yeddyurappa, along with MLA S.A. Ramdas, is seen watering a sapling to inaugurate the thanks-giving meeting of BJP (Krishnaraja Assembly Constituency) held at Rajendra Kalamandira on Ramanuja Road in city yesterday as others look on. “The CM is thinking that he can buy more time on loan waiver so that he can later hoodwink the people of Karnataka by washing his hands off the loan waiver promise. We will not allow this to happen. If he did not have the capacity, Kumaraswamy should not have announced the loan waiver in his manifesto. We will compel him to fulfil the promise to farmers,” Yeddyurappa said. Analysing the party’s failure to reach the magic number 111 in the Assembly election, Yeddyurappa said, “I had prepared for the election with State tours. We expected to win about 135 seats. But, in 24 constituencies, the BJP candidates lost with a small margin of 500 to 2,000 votes. Referring to Kumaraswamy’s statement that he has became the CM on the courtesy of the Congress party, Yeddyurappa demanded him to apologies to the six crore people of the State. Reacting to the allegation of Kumaraswamy that he misused the Government funds/ facilities by taking a helicopter to participate in the funeral of Ilkal seer, he said that the Government itself provided him with the facility when he was officiating as CM. “He should enquire about this with the Chief Secretary. I am ready to bear the expenses, if the Govt. deems so,” he said. Claiming that the BJP had done more for the education sector when it was in power, Yeddyurappa appealed to the voters to choose BJP candidates for the Graduates and Teachers Constituencies (Legislative Council) elections to be held on June 8. Alleging that the Congress government had accorded least priority for education in the last five years, the former CM, while interacting with teachers at Rajendra Kalamandira last evening, said that the Department has grown to be the most corrupt one in the last five years. He appealed to the teachers to cast votes in favour of B. Niranjan Murthy from the Teachers Constituency.